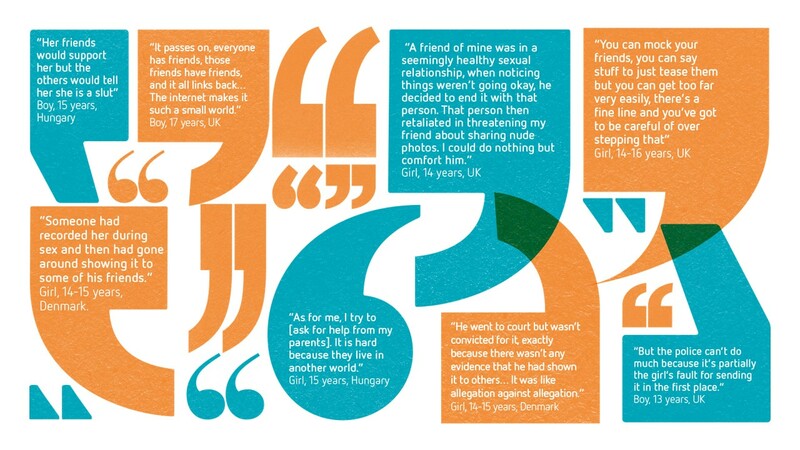 Empowering young people to speak up about online sexual harassment The research revealed that young people face many barriers that can prevent them from speaking up about online sexual harassment. Young people in the UK are more likely to turn to their friends if they experienced online sexual harassment (68%), compared to their parent or carer (39%), the police (18%) or a teacher (15%). While the majority of UK teens (81%) said they would block the person on social media, just 38% said they would report them. Over half of UK teens (53%) said they would just ignore it, with young people reporting a range of barriers that would prevent them from speaking up. To help young people overcome these barriers, Project deSHAME, coordinated by Childnet, will now begin to develop educational resources to equip schools to effectively prevent and respond to online sexual harassment among young people and empower them to speak up. Defining online sexual harassment: In the report, online sexual harassment is defined as unwanted sexual conduct on any digital platform and it is recognised as a form of sexual violence. Online sexual harassment encompasses a wide range of behaviours that use digital content (images, videos, posts, messages, pages) on a variety of different platforms (private or public). It can make a person feel threatened, exploited, coerced, humiliated, upset, sexualised or discriminated against. This report specifically focuses on peer-to-peer online sexual harassment taking place between young people. Such harassment takes place in a gendered context, with girls being more likely to be targeted than boys - particularly for some forms of online sexual harassment – and these incidents often resulting in more negative outcomes for girls. In the report online sexual harassment has been categorised in four main types. These different behaviours are often experienced simultaneously and can overlap with offline experiences of sexual harassment.